It’s Weigh In Wednesday. How did you do? I stayed the same. I know. I know. I should be setting an example for you guys. But at least I didn’t gain! That’s a step. So while you’re removing your bloomers and bangles and preparing to go face-to-face with your maker (i.e. The Scale), here’s something to distract you. 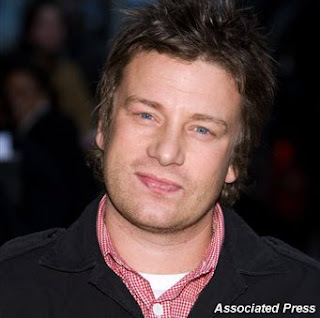 I’ve watched the first two episodes of Jamie Oliver’s Food Revolution and it just made me sad. These poor kids in Huntington, West Virginia, (called the unhealthiest city in America) are being fed pizza for breakfast and chicken nuggets for lunch and dinner. Where are the vegetables you ask? French fries. That's right. French fries. I don’t know about you, but I’ve never considered French fries a vegetable! This show will make you want to eat a salad. A big, healthy salad. Speaking of salads, Jamie also has some recipes you can try out. His Everyday Green Chopped Salad looks really good and easy enough to make. So good luck on the scale today! And don’t forget to email me your weigh in results at WeighIn@captivate.com. Don’t worry. We’ve still got 11 weeks until summer begins. Every little bit counts! This entry was posted by kate, on Wednesday, April 7, 2010. You can leave your response .